Some time ago we needed new storage for our 2-node RAC cluster because of disk warnings on our NFS storage server. We use this cluster for performance load and stress testing only so there is no production involved. Rebuilding the cluster was an option but we preferred not to do so since Oracle has many features to maintain the RAC environment. Plan is to move everything from DATA_OCR to new data group DATA_OCR_VD. At the end of this process ocrconfig_loc will be changed to the new DATA_OCR_2 data group. 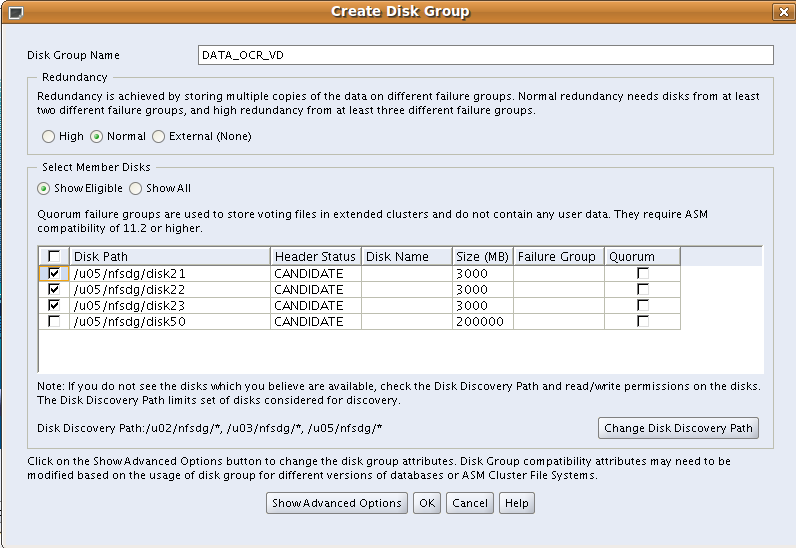 ASM is using 3 voting disks for NORMAL REDUNDANCY. Backup files are approximately 7Mb each. All three items will be moved to disk group DATA_OCR_VD. Spfile is pointing to the new location on node 1.